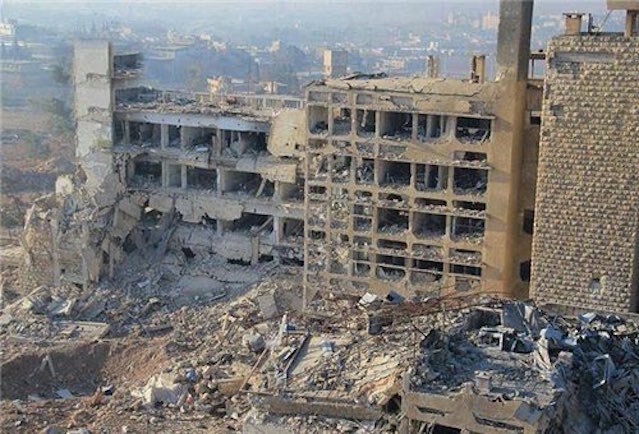 Video: US-backed Free Syrian Army and al-Qaeda in Syria blow up al-Kindi Cancer Center; once the second largest hospital in the mid-east and which gave Free treatment to cancer patients who could not afford it. People came from many nearby countries to seek treatment at al-Kindi and the Center was a great source of pride. ​Photos: Al-Kindi Cancer Center, before and after the US-backed Free Syrian Army and al-Qaeda destroyed it. Hospitals are NOT being targeted by the Syrian Armed Forces. Hospitals are targeted by the "opposition" terrorist groups such as the US-backed Free Syrian Army and al-Qaeda in Syria. Once these hospitals were captured by the "opposition", most of the hospitals were then used for massive stockpiles of weapons and other supplies for the terrorist "opposition" groups. ​In the case of al-Kindi Cancer Center, just one example of many hospitals, the US-backed Free Syrian Army captured it in 2012 and slowly destroyed it. Doctors were forced to leave al-Kindi due to "opposition" bombings of the hospital. The photos you see of destroyed hospitals were destroyed by "opposition". The "opposition" usually does this with attacks with "Hell Canons" and mortar shelling from the outskirts, but also by conducting suicide bombings. Hospitals destroyed by "opposition" groups were evacuated early on in the attacks. Only after evacuation and after being filled with weapon stockpiles and terrorist cells does the Syrian Air Force begin to target the terrorist cells and their weapons. Doctors are NOT leaving Aleppo. Aleppo province has 92 hospitals -- 72 are functioning and working and no doctors are leaving. But 16 of the 92 hospitals are in "opposition" held East Aleppo. Those 16 hospitals were attacked and captured by the "opposition" in 2012 and 2013 and have been under full "opposition" control ever since. The medical equipment was sold and the hospitals that were not demolished by "opposition" are used as weapons storages for al-Qaeda and the US-backed Free Syrian Army. The US-backed Free Syrian Army and al-Qaeda in Syria (aka al-Nusra) have been working together in coordinated attacks on civilian areas as early as 2011 (see note at bottom: "Massacres"). When al-Qaeda and the US-backed Free Syrian Army began capturing East Aleppo in 2012, hospitals were one of their first targets. Doctors who survived the various terrorist attacks on hospitals in East Aleppo in 2012 and 2013 evacuated. The hospitals no longer functioned because the medical equipment was taken and sold. Most all of the doctors relocated elsewhere in other parts of Aleppo. Many doctors work for free in Aleppo and often work in makeshift hospitals on the outskirts of areas being hit by the terrorist opposition groups. The Free Syrian Army has been torturing, massacring and committing atrocities on the Syria people since 2011. Never forget the little boy who was filmed in July being tortured and sodomized for many hours by the US-backed Free Syrian Army before they slowly beheaded him -- proudly displaying the dull knife that would be used to cause the most suffering. The little boy was taken out of a hospital, with his IV tube still dangling from his arm when they began filming the torture. They said the little boy "deserved it" because he was a "government supporter". He was just a child. This is often the opposition's excuse for targeting hospitals, that the people inside are "government supporters". The Free Syrian Army are "terrorists" and should not be called "opposition". But Western media calls them "opposition" to mislead you into thinking they are the good guys -- that the West should support them. When the terrorist Free Syrian Army and al-Qaeda were attacking East Aleppo they also targeted market places and schools -- any location in which there was large gatherings of civilians. Civilians who survive these terrorist attacks usually evacuate to "protected" areas in West Aleppo. All Syrians call these areas "protected" areas. But mainstream media calls these "protected" areas "government controlled" or "regime controlled" to make you think something sinister or evil, or that people are inhibited or "controlled". It is the exact opposite. ​In the "protected" areas people go about their life normally. They go to school, work, to market, have coffee at the coffee shop and visit friends. They are "protected" by the Syrian Armed Forces in the "protected areas". Civilians who were able to evacuate from East Aleppo and move to West Aleppo were immediately provided for by the government. They receive free food, housing, medical care, immediate placement into schools for the children, and even receive free textbooks. Russia is not the enemy. Always remember that Russia was an ally in World War II and fought a great evil. Now Russia is again fighting another great evil: Islamic Terrorism. Russia is not an aggressor in Syria -- the terrorist opposition groups are the aggressors. Russia was invited into Syria to help fight the enormous number of terrorist opposition groups inside Syria that are trying to establish an Islamic government. Not one of the "opposition" groups desires democracy. Every one of them is enforcing Islamic Law in the areas they control. Syrian National Defense Forces fight the terrorist groups in their own region. They can choose to fight the terrorists in their own villages, towns and cities -- and most all do -- wouldn't you? They defend their own families and community. It is absurd to think they would target their own hospitals, schools and market places. Only in neighborhoods that have been previously evacuated of civilians are the terrorist cells and weapons stockpiles then bombed. The US backs the Free Syrian Army who are the ones conducting the attacks on civilians and hospitals. You are being bombarded with propaganda to make you believe otherwise. Video: During the week of October 9, 2016 the Syrian Armed Forces were finally able to regain control of parts of Aleppo that have been held by the Free Syrian Army and al-Qaeda since 2012. All around the hospital the Syrian Forces found "hell canons" which were used to slowly demolish the hospital in this video.